The link below is part 1 It cover much of what happened from the beginning of this disaster. I thought it best to start a new post as the other was so long. There is a total of 47 missing. They are still looking for the remains of 5 who died. MONTREAL — Victims of the Quebec railway disaster have launched further legal action against companies linked to the derailment that obliterated their town — and one lawyer insists the multimillion-dollar cascade has only begun. The family of a Lac-Megantic man killed in the fiery crash filed a wrongful-death lawsuit Monday in a U.S. court against rail and petroleum firms connected to the oil-filled tankers that slammed into the town. Their lawyer, Peter Flowers, told The Canadian Press he expects to present many additional, individual lawsuits like this one before the end of the week. “We expect 15 to 20 at least over the next couple of days,” Flowers, of Chicago-based Meyers & Flowers, said in a phone interview Tuesday. 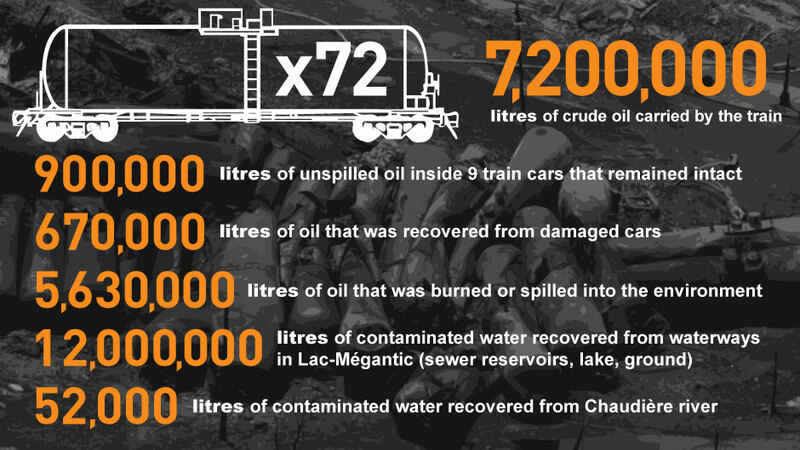 Word of the looming lawsuits surfaced as Lac-Megantic’s mayor announced Tuesday that her municipality has threatened to sue the railway operator at the centre of the derailment — Montreal, Maine & Atlantic Inc. — for $4 million. Colette Roy-Laroche alleges that MMA has failed to cover the costs of the post-disaster cleanup, forcing the town to write the cheques itself. Companies connected to the derailment may also face another hurdle in the future: a motion presented last week in a Quebec court seeking permission to file a class-action lawsuit over the crash. The derailment in the town of 6,000 set off several massive blasts, wiped out part of the downtown core and is presumed to have killed 47 people. On Wednesday alone, Flowers expects to set in motion as many as five additional wrongful-death lawsuits at the Cook County courthouse in Illinois. His first suit, launched Monday, was initiated by the family of Jean-Guy Veilleux, who was killed in the runaway-train disaster. The Quebec coroner’s office publicly identified Veilleux, 32, on Tuesday as one of the victims. Plaintiff Annick Roy is seeking damages from 10 defendants, including MMA, its major stockholder Rail World Inc., top rail executive Edward Burkhardt and several American petroleum companies. Roy is identified as the administrator of Veilleux’s estate as well as the guardian of the estate belonging to their daughter, who is a minor. “On July 6, 2013, plaintiff’s decedent Jean-Guy Veilleux was present in downtown Lac-Megantic near the site of the derailment and was consumed by the fire and explosion,” reads the court document, filed in the Cook County courthouse. The suit pegs the overall damages sought at more than $200,000, but Flowers maintains this is just a base amount and insists the eventual target sum will be far higher. Calls placed Tuesday to most of the defendants listed in the lawsuit were not immediately returned. Roy also alleges in the suit that the defendants were negligent for transporting crude oil in the flawed DOT-111 tanker cars, which have been known to rupture during derailments. The document highlights how there has been a considerable increase in oil-by-rail transport in recent years. Flaws in the DOT-111 tanker have been noted as far back as a 1991 safety study. “There’s been problems with these tankers and how they protect what’s inside of them — for years,” Flowers said. Other defendants named in the lawsuit include firms in the U.S. petroleum industry: World Fuel Services Corp., Western Petroleum Company, Petroleum Transport Solutions, Dakota Plains Transloading, Dakota Petroleum Transport Solutions, Dakota Plains Marketing and DPSTS. Burkhardt, president of Illinois-based Rail World and chairman of MMA, was the only individual listed in the suit. The document notes Burkhardt’s work as president, CEO and chairman of Wisconsin Central Transportation Corporation. It alleges that the company reduced crew sizes under his leadership as a means to cut costs — a measure that also allegedly increased the accident rate. The lawsuit mentions how Wisconsin Central was involved in a 1996 fuel-filled tanker derailment in Weyauwega, Wis., while Burkhardt was at the head of the company. The subsequent explosions from the crash forced more than 1,700 people from their homes. The document also cites a 2009 derailment of tankers filled with highly flammable ethanol in Cherry Valley, Ill., a crash that involved a different company. In 2011, the family affected by the Cherry Valley derailment received a $36.2-million settlement from Canadian National Railway. One member of the family was killed, another lost her baby and two others suffered burns in the incident. Back in Lac-Megantic, the mayor said MMA has not yet paid any of the workers it hired to clean up the crude oil that leaked from the dozens of tanker cars. Roy-Laroche said the town has had to pay MMA’s suppliers $4 million after some workers threatened to walk off the job. She urged the company to start assuming its responsibilities. ‘It strikes me it’s not asking a lot, given the circumstances,” she said. Paul McCartney paid tribute to victims of the Lac-Megantic tragedy Tuesday night, offering free concert tickets and dedicating a song to survivors at a concert. Luci Tremblay said 1,000 tickets had been set aside for Lac-Megantic residents, with about 900 taking up the offer. About 10 buses were also donated in the Lac-Megantic area to bring them to the show. MM&A owes $7.8 million to the town to date. A rather sad response I must say. The below page is dedicated to all those who perished. Information on how to donate to the victims of this horrific disaster. They will need all the help they can get.